As transportation industry facility owners look to protect their structures from corrosion while decreasing the inconvenience to the traveling public, many are turning to thermal spray coatings instead of the more conventional liquid coatings. Thermal spray coatings have a history of lasting anywhere from 30 to 50 years before any repair work is required; thus, the higher front-end cost of TSC pays for itself, and with less repair work required, the public is not inconvenienced as often. The thermal spray coating (TSC) material used most frequently in the U.S. transportation industry is 85/15 zinc aluminum. The TSC is either left exposed to the elements to form a natural sealer through oxidation of the zinc and aluminum, or it is sealed using a penetrating sealer soon after the TSC has been applied. Adhesion testing of the TSC is generally called for in accordance with ASTM D4541, Test Method for Pull-Off Strength Using Portable Adhesion Testers. According to SSPC-CS 23.00(I), Interim Specification for the Application of Thermal Spray Coatings (Metallizing) of Aluminum, Zinc, and Their Alloys and Composites for the Corrosion Protection of Steel, the minimum adhesion value to accept with 85/15 Zn/Al TSC is 700 psi. Here’s how one project led us to investigate whether oxidation of the TSC or penetrating sealers affect the adhesion values of the TSC. Although the bonding mechanism and duration of improved adhesion are not completely clear, our field tests indicate that sealers can improve TSC adhesion. More important, we realized that when specifying adhesion testing over TSC, the specifier should indicate whether testing is to be done on the sealed or unsealed coating. In 2002, the Niagara Falls Bridge Commission set out to achieve the long-term benefits of TSC on its heavily traveled Rainbow Bridge, which joins Niagara Falls, New York, USA, and Niagara Falls, Ontario, Canada. Our company managed the 450,000-square-foot (40,500-square-meter) project. The objective of the field testing was to determine what effects, if any, the natural sealer from oxidation of the TSC or the penetrating sealer would have on the TSC’s adhesion values. A test was set up using three separate plates. 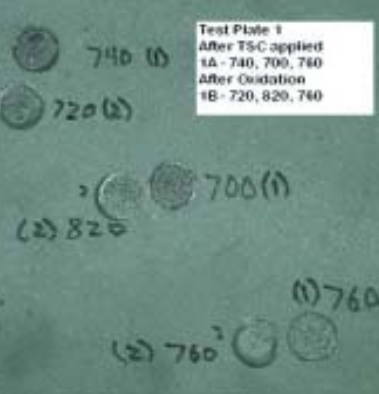 All plates were abrasive blast cleaned to SSPC-SP 5, White Metal Blast Cleaning, using #20 nickel slag. Anchor profile was 4.0–4.5 mils. A two-component epoxy adhesive was used to set the dollies. Adhesion testing was conducted with a PosiTest® AT-M self-aligning adhesion tester in accordance with ASTM D4541, test method E. Plate #1 (Fig. 1) had TSC applied to an average thickness of 12.8 mils; three dollies were placed on the plate and pulled the following day to represent 1A. The average adhesion value of the three was 733 psi, with results of coating adhesion failure to the substrate and cohesive failure within the TSC. 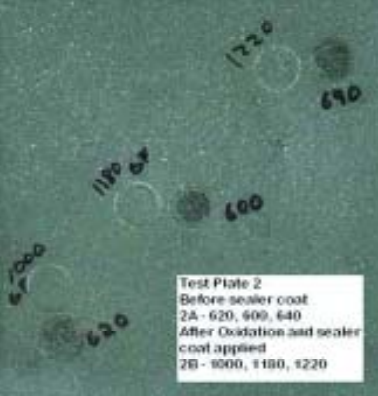 The plate sat for three months at temperatures from 65 to 80 F (18 to 27 C) and 50–70% relative humidity (RH), allowing oxidation of the TSC to take place. Three dollies were once again placed on plate #1 and pulled the following day to represent 1B. 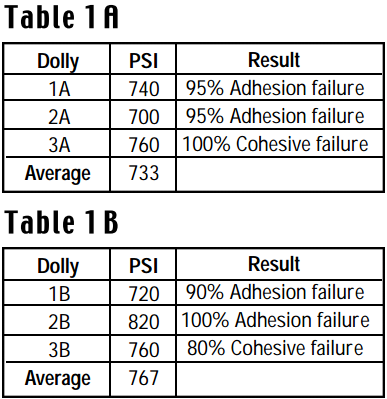 The average adhesion value of the three was 767 psi, with results of coating adhesion failure to the substrate and cohesive failure within the TSC (Tables 1A and 1B). There was only a 5% increase in the adhesion values and no change in the failure modes, suggesting that the naturally occurring oxide sealer formed within the TSC did not have a direct effect on the TSC’s adhesion. Plate #2 (Fig. 2) had TSC applied to an average thickness of 12 mils; three dollies were placed on the plate and pulled the following day to represent 2A. The average adhesion value of the three was 620 psi, with results of coating adhesion failure to the substrate. 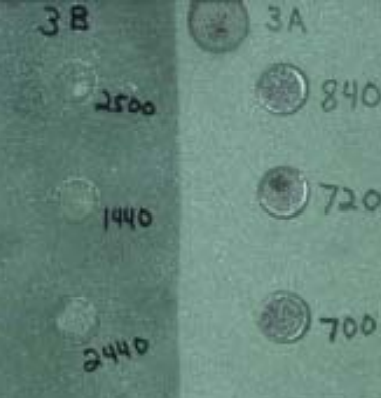 The plate sat for three months (65–80 F [18–27 C] and 50–70% RH), allowing oxidation to take place. A penetrating seal coat of Corothane I Preprime (cured at 800 F [427 C] and 60% RH) at a thickness of 0.5–1.5 mils (13–38 microns) was then applied. Three dollies were placed on plate #2 and pulled the following day to represent 2B. 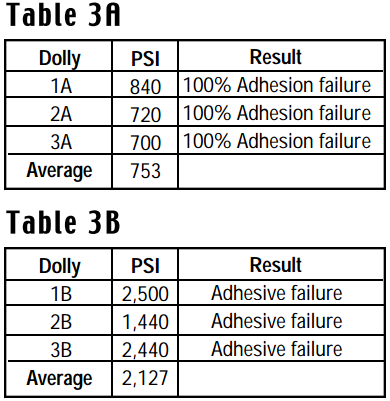 The average adhesion value of the three was 1,133 psi with 100% adhesive failure (Tables 2A and 2B). These results indicate that the sealer had a definite effect on the adhesion of the TSC, with an increase of 83% in the adhesion values. Plate #3 (Fig. 3) had TSC applied at 10.4 mils. The plate was masked, dividing it into two sections. Sealer was applied to the exposed TSC at 0.5–1.5 mils. After the sealer had cured, three dollies were placed on each section and pulled the following day, the unsealed section representing 3A, and the sealed section representing 3B. The average adhesion value of the unsealed section was 753 psi, with coating adhesion failures at the substrate. 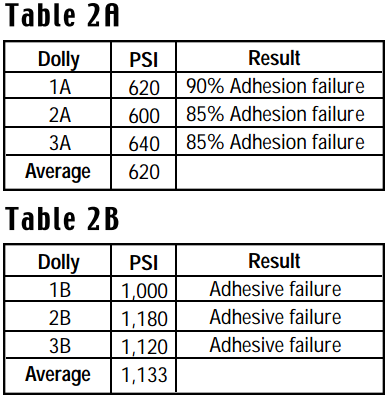 The average adhesion value of the sealed section was 2,127 psi with adhesive failure (Tables 3A and 3B). The increase of 183% in adhesion values with the sealed versus the unsealed section indicates a substantial increase in adhesion values when the sealer is applied soon after the TSC. Our field tests found that natural oxides, which develop in the pores of the TSC, do not affect its adhesion values. Liquid sealers can effect adhesion values of TSC even when applied after minimal oxidation has occurred. They also have an effect on adhesion values when applied shortly after the TSC, our tests found. Sealers with good wetting properties can penetrate loose areas (or cracks) and seal the voids and pores in TSC. It may be that when a penetrating sealer is applied over TSC, the sealer seeps into the TSC’s pores and voids and creates a stronger bond. When TSCs are considered for corrosion control, the owner should look at the benefits of applying a liquid sealer to the TSC. SSPC-CS 23.00(I) recommends applying the sealer as soon as possible after TSCs, or within eight hours. The increase in the adhesion values of the TSC with the sealer applied within these parameters is apparent and should be noted. When specifying adhesion testing on a project, be sure to specify if the testing is to be done on the unsealed or sealed TSC. Robert H. Unger, “Thermal Spraying of Bridges,” Thermal Spray: Advances in Coatings Technology, Proceedings of the National Thermal Spray Conference, Orlando, FL, USA, September 14–17, 1988-8708-011. Joseph T. Butler, Metallizing for Corrosion Control, Vol. 1, Issue 1 (January 2000). SSPC-CS 23.00(I), Interim Specification for the Application of Thermal Spray Coating (Metallizing) of Aluminum, Zinc, and Their Alloys and Composites for the Corrosion Protection of Steel, SSPC Painting Manual, SSPC: Pittsburgh, PA (March 2000).